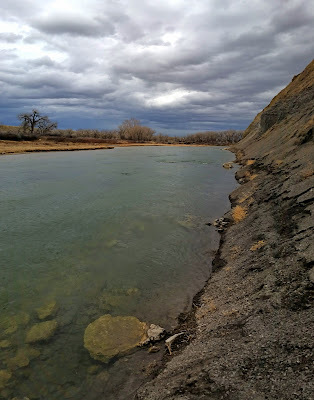 I could see on the calendar that my travels would soon take me within striking distance of a favorite river. That always gets the juices flowing. It's an out-of-the-way place that is an investment to get to under normal circumstances. Not that my gear wouldn't have been with me anyway, but I made certain my boxes were in order and well-stocked. As it turned out, enough time remained at the end of the day to strike and being sure to Always Travel With Fishing Gear paid off. 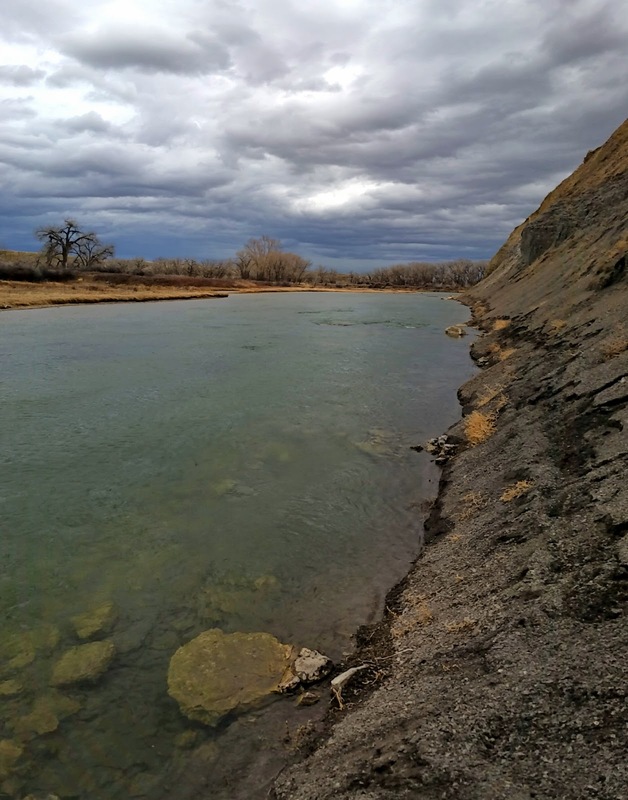 When the work was done, I rambled down the gravel road I was already on, then veered off along a little two-track that would take me to a particular hole that always holds fish. Over the years I have found big browns, hunky rainbows, the occasional walleye, and a number of pike in that spot. Today, at the end of March, I was anticipating pike and trout. A little early for walleye in the river. 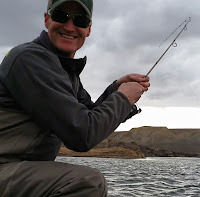 So I rigged a lighter rod with 6-pound monofilament for trout - upped from my usual 4-pound for some incidental pike insurance - and tucked a stout nine-and-a-half foot spinning rod strung with a braided line and outfitted with a beefy floating plug in my belt behind me. Honestly, I hoped I would see a brown worthy of hitting that plug as much as a pike. I started working the head of the hole where the current slides over a series of riffles and then slams into a vertical bank. From there it continues along the steep bank for a couple hundred boulder-strewn yards before turning another corner and jumping into a series of smaller holes. So it's not really one hole, just a productive bend with lots of structure. I gave equal time to the trout and pike rods, having found the two different fish in identical holding water on this river in the past. The going was slow. I had picked apart all the prime stuff and found nothing. I cycled through various jigs. I had swung the plug across what felt like every lane and hovered it in every seam. The wind was a constant adversary. Then, while swinging the big plug through the tailout of the main hole, the sort of brown I was hoping to see fell in single file behind the plug. Interested, but obviously non-committal, he just followed. But came close enough and hung out long enough for me to see the curve of his hooked kype and broad fanning fins. A gorgeous two feet or more of trout. As he slipped back to his slot I mentally marked his position. Having only seen the single fish in my targeted reach of river, I picked up and moved to another one I had in mind. In light of fighting the nasty wind, and it wreaking havoc on my jigging, I opted to switch out to a number 7 countdown and use the constant tension of its retrieve to my advantage. Compared to the jigs it casted like a ping pong ball in the wind, but once in the water I was getting a much less compromised presentation. The hole I was casting to now has been a good trout producer in the past. I'd never seen a pike in it, although that doesn't really mean anything. Conscious of being under-gunned, I dropped my rod tip to full slack as he inhaled, cranked back on the drag loosening it to near-zero, and then raised to meet him for the hookset as he surged away. I palmed the spool for tension to ensure connection and then let him freely peel the 6-pound mono with little resistance. Glad it wasn't 4! The line survived the first run on the loose drag and I started adding the pressure back. It was handy to have seen him take and be able to react accordingly, totally avoiding the shock of the initial run. Ironic the pike should nail my trout setup and the brown followed my pike rig. 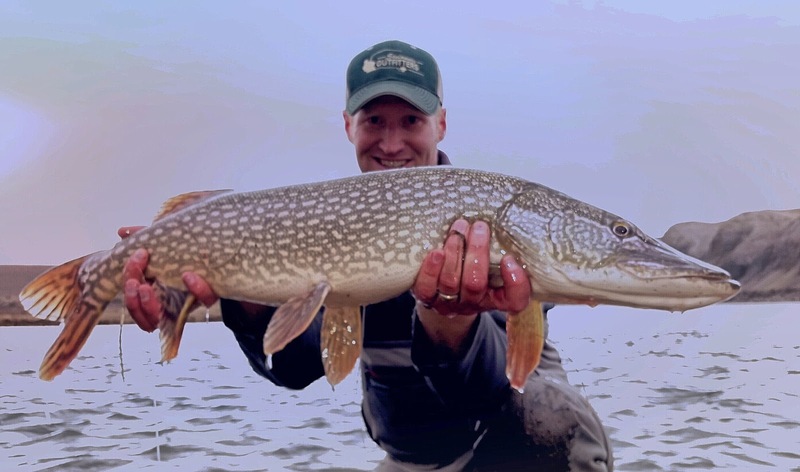 He wasn't a monster pike, but he wasn't a runt, and I would have much preferred to have him hooked up on the rod that was stowed in my belt and brought along for just such a fish. When it looked like I was going to get the upper hand in the fight if my line remained unsevered, I set up my little tripod and prepped for a photo. With the howling wind I couldn't get the camera to register my voice commands and had to resort to the timer. I determined this before bringing the fish to hand. Once he was ready, I tailed him in the shallows, managed a couple awkward pictures, and then slid him back in the water. Mission accomplished. I'd landed another nice fish by making sure an opportunity didn't pass by. I'd ended an otherwise normal day in a pair of waders - tromping through brush; blasted by wind; pelted by blowing sand; risking the impermeability of my waders over barbed wire; sliced my thumb on a pike tooth; bled all over my gear; fought the mud and loose ground - you know, the stuff of a fulfilled day. Before I could really be done though, I returned to where I'd started. The little buzzer in my brain was going off telling me to check on the appetite of that brown who'd followed earlier. I swung the countdown that the pike had taken across his haunts. Didn't see him again, but I sure could have. Returning to a located brown quite often produces results. I could leave satisfied now. If I'd driven home without taking another stab at that big trout I'd have been haunted with what-ifs for days.